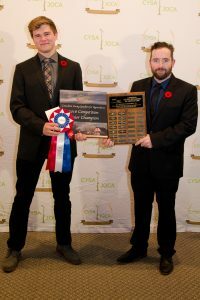 The Canadian Young Speakers for Agriculture (CYSA) Competition is pleased to announce the winners of the 2016 competition which took place Saturday, November 5, at the Royal Agricultural Winter Fair in Toronto. What is the impact of public opinion on Canadian farmers? How would you explain a GMO to a non-farmer? How can we improve the media’s perception of Canadian agriculture? Old MacDonald had a farm – but what about Mrs. MacDonald? “Once again it was wonderful to see the continuing interest of the very talented young people across Canada that want to speak out about agriculture. 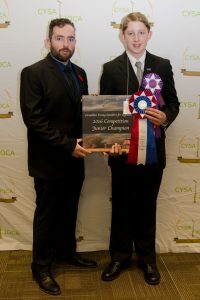 From a board perspective, we all take great pleasure in ensuring this exciting competition prevails annually to capture the thoughts of each and every participant,” said Ted Young, CYSA Board Chair. CYSA also took the opportunity to present long-time board member and past president John J. MacDonald with a plaque recognizing his more than 10 years with CYSA and naming him Honourary President. CYSA also presented a recognition plaque to honour board member and past president Richard Kutnz who is concluding his term on the CYSA board. This year also saw a change in board members with Gerry Sullivan (Newfoundland) becoming past-president; April Stewart (Quebec) stepping into the role of president; Christina Crowley- Arklie (Ontario) becoming vice-president; and D.E. ‘Ted’ Young remains Board Chair.